Wow, my first blog, and with it a daring new adventure into a different world! Or at least a fun new way to spend my evenings and weekends. If you are reading this, please bare with me as I work out what on earth it is that I am doing, as I go along. My day job as a data assistant within a marine data centre has left my creative abilities feeling somewhat untapped, and since I like to be let loose in the kitchen, this has over the years resulted in some interesting experiences, both good and bad. 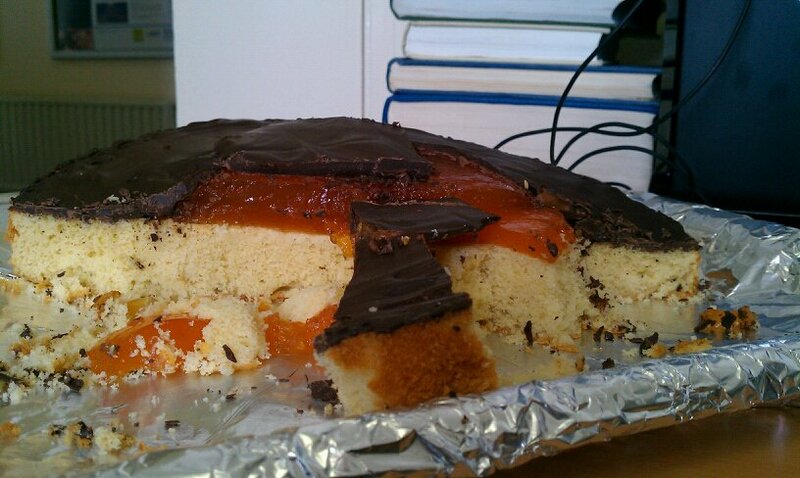 My favourite is perhaps a flour mishap, which resulted in a biscuit thin, exceptionally solid cake, iced with excessively over-flavoured rum icing, and served when 95% of those eating the cake were somewhat worse for wear from the activities of the night before! On the upside however, there have been plentiful, much, much more positive outcomes, and so with a burning desire to expand my cake making creative talents, I have decided to share my adventures, triumphs, and (hopefully few!) failures on the all reaching web! For a little taster the future of Bake me a picture, I would like to include some of the previous work I have done. 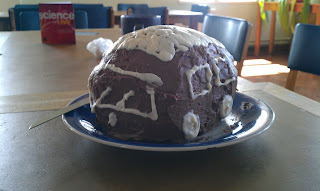 Here are a few little pictures of bits and bobs, usually birthday cakes created for people at work. Happily I like my colleagues so they get some good cakes. My Mum, in her glory, and infinite wisdom, happily gave me a fantastic cupcake stand for a Christmas present this past December. As a result I have become a woman obsessed, and whip this little piece of equipment out at every available opportunity! I love how neat, and beautiful it can make a set of either plain, or decorated cupcakes look. And so it came to be, that on my boss's birthday this year, a new occasion arose on which I was able to once again. 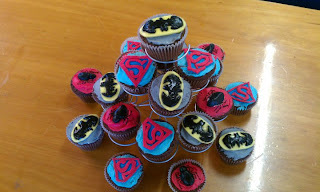 His favourite super hero is batman, a fine choice I think, and so my colleague had the idea that we should make him super-hero cupcakes. A fine plan I thought and to work I went to create these little gems, with Batman, Superman and Spiderman symbols, beautifully stacked and arranged on the amazing stand. My boss was thrilled, and despite being in his 30's had a facial expression much closer to those normally witnessed on the faces of those aged around 5 when presented with money, and a sweet shop. Recently a colleague spent a month away travelling in Europe in a van. She chose the month of her birthday to do this, posing the dilemma of when to make her birthday cake. This was easily solved with the unbreakable will power I apply where cake is concerned, by simply convincing all parties involved that her birthday had in fact moved forward two weeks and refusing to accept any protests otherwise. This little cutie was whipped up really quickly with a bread machine chocolate cake recipe, covered in copious amounts of chocolate butter cream, and a little vanilla butter cream piped on for the decorative bits. The birthday girl and I share the trait of being die-hard chocoholics and so this cake went down very well. Possibly one of my favourites, and very nearly one that didn't make it. This cake, was a sad occasion cake, as a leaving cake. However, any reason to bake something fun is still a silver lining! 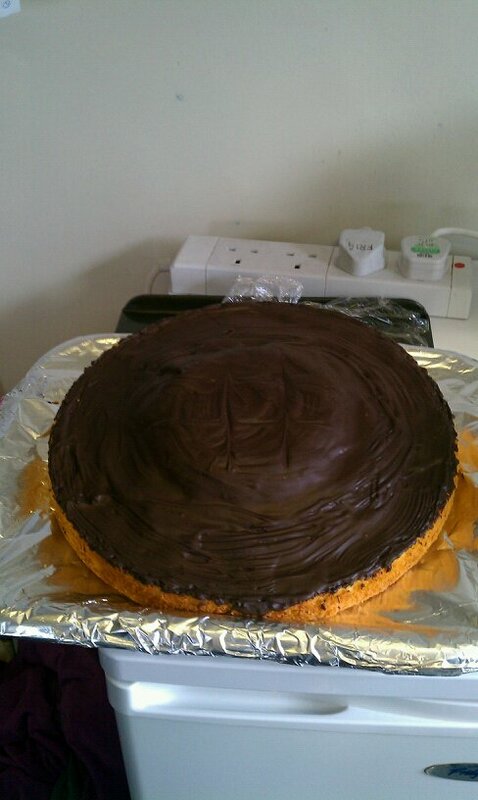 I had a conversation with the guy in question many months previously, where we discussed whether or not making a giant Jaffa cake would work. He very much wanted one, and thus a request for a birthday cake was put in ... sadly he left before his birthday, however as I said any excuse! As I mentioned, it nearly didn't make it, there was a slight incident with moving the thin, moulded chocolate onto the cake and adding warm melted chocolate, I very nearly had a melty chocolate mess all over my kitchen floor, thankfully I managed to spot my mistake in time, and papered (with chocolate) over the cracks so it came out OK. The pictures below show the finished product and the inside jelly goodness. Well I certainly hope that you have enjoyed reading about my past cake baking exploits! And I look forward to working on my next project ready to post it up here. Any and all ideas for inspiration on what kind of cake art I should make my next project are greatly welcomed!